Notes: bettas may survive gill damage when other fish would succumb because they primarily utilize their labyrinth organ to breathe. Hyperplasia in general is the increase in the number of cells in a given location; for example, tumors. In bettas, hyperplasia of the gills is the most common as the gill tissue is very sensitive and susceptible to damage from toxins. Ammonia and nitrite, for instance, can reek havoc on fragile gill tissue even at seemingly low levels like .25 -.5 ppm. In basic water with a pH above 7.0 toxins become considerably more potent. It’s not uncommon for damaged gill tissue to form a stringy mucus similar to that of a bacterial disease like Flavobacterium columnare. that causes the swelling and partially open operculum (gill cover). This new tissue growth is what we call Hyperplasia. It’s essentially creating a scar that makes it harder for the Betta to get oxygen from the water. Another thing to keep in mind is that toxins aren’t the only cause of gill swelling. This could easily occur from an injury, either from tank décor or other fish. If your water quality is in good shape it’s possible the cause is from physical irritation. Chlorine and chloramine exposure could also create a problem. Keep in mind exposure to toxins may have occured before you purchased the fish. Severe Hyperplasia is generally irreversible but there are some steps you can take to help your Betta. First, keep the water clean and free from any toxins. Separate out any aggressive fish that may be taunting your Betta and remove or fix any sharp or jagged aquarium décor. Aquarium salt can be very useful for improving gill function and is frequently used to guard against nitrite poisoning. I recommend 1 TBL spoon per 5 gallons of water. Be sure to use aquarium salt and not table salt and add the salt to the change water instead of the tank directly. This will help you avoid an accumulation of salt over time since it doesn’t evaporate. Since your Betta may be relying on his labyrinth organ more then usual, he may be more comfortable near the surface. Make sure the water isn’t too deep and that he has places to rest near the surface. 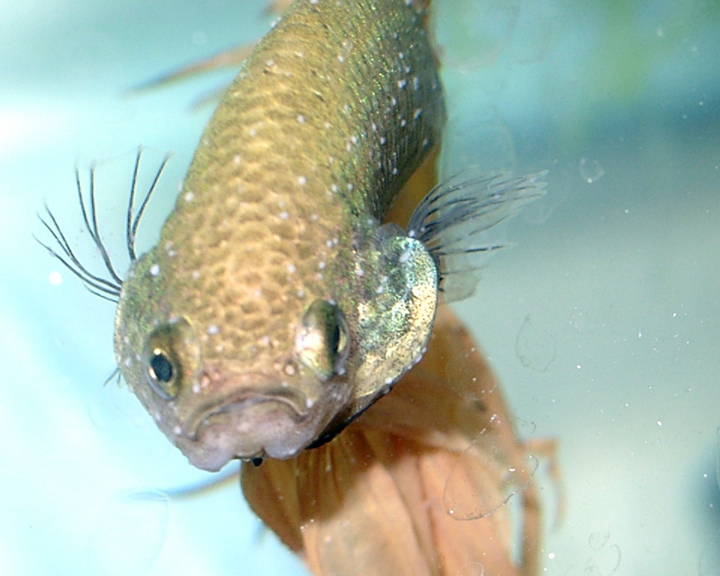 The labyrinth organ works independently from the gills, so your betta has the advantage of having a secondary means of getting oxygen over other fish that would succumb from the gill damage. In some cases, hyperplasia may also effect the labyrinth organ.